Once upon a time I was an avid reader. I was always in the middle of a book and usually read for an hour, or two, before bed. When I met John my interests changed and I put the books on the shelf for a few years. I was too busy working, keeping house, cooking and spending time with John, to find time to sit down with a good read. I didn't realize how much I enjoyed reading until John gave me a Kindle for Christmas with a note telling me to think of him reading to me every time I pick it up. When we were in Costa Rica last December, John spent many evenings reading to me from stories he had downloaded to his laptop. After that trip, we decided it was time for me to go back to Costa Rica for a few weeks to supervise the construction of our perimeter wall, gate, etc. I made my plans to travel this past February and I started downloading books from Amazon to help make the time in Costa Rica go faster. What was supposed to be a 3 week trip, turned into a 6 week trip and my Kindle became my constant companion. Two weeks into my stay, I discovered I had read everything I had downloaded from Amazon's wireless Whispernet service. This service allows you to download a book directly to the Kindle in less than 60 seconds, but it is not available in Costa Rica. I decided to see if it would be possible to download books from Amazon through my SLOW dial-up internet connection to my laptop and then upload them to the Kindle via a USB cable. It worked far better than I expected and I was able to download novels in just a little over 60 seconds. During the 6 weeks I was in exile (away from John) in Costa Rica. I managed to read 17 books. Just to name a few, I read several novels written by Clive Cussler, Nicholas Sparks, David Baldacci, John Sanford, Michael Crichton and Paulo Coelho. I am so grateful to John for giving me my little Kindle and bringing me back to the joy of reading. Needless to say, I would rather spend my time in his company, but now that I'm retired, my Kindle keeps me entertained while John is working. 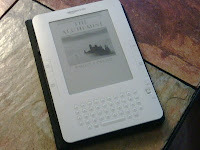 Now, when John retires, I'll have to give him his own Kindle or we'll be fighting over mine.